Our eight-year-old came home from school yesterday with tears in her eyes. She told me she was tired, had too many activities, and wanted to quit something. She mentioned that I wouldn’t be happy about it. She said she wanted to quit soccer. I immediately knew what the problem was: her best buddy at school has Mondays free, and soccer practices will begin next week, on Mondays. This will be our little one’s first year playing select/competitive soccer. Spring session has two practices each week, which adds a load to her already busy schedule. But the kid loves soccer. She worked hard to prepare for her first-ever tryouts, and she has been totally jazzed about the upcoming practices. Still, she is eight, and she wants to play with her buddy. Kids are notoriously short-term thinkers. They are all about immediate gratification and have a harder time than we adults at delaying gratification for a later date. When faced with a desire for something tangible and immediate, like a play date with a best friend, kids struggle to see the forest for the trees. Rational, logical thinking can easily become a thing of the past or the future when the possibility of a play date is on the line. As a parent of two, I’ve gotten used to this scenario, but the challenge of getting a very determined eight-year-old to become more flexible in this regard remains a daunting one. Did I tell my daughter that she could quit competitive soccer before she even started, so that she could enjoy her play dates on Mondays? Of course not. Did I explain to her that some day she will appreciate my parenting and will probably be stunned that she had ever even considered quitting? Yes. Did she come to her own senses within hours? 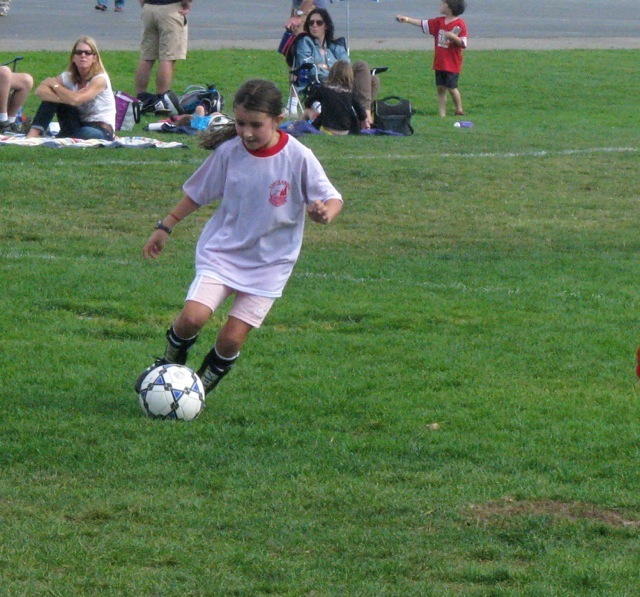 Thankfully this time, yes–another indication of how much she loves soccer. Phew. This whole interaction got me thinking about how we know for sure when it’s time to quit something. How do we know when something we’ve enjoyed in the past, something to which we’ve devoted hours of our time and boatloads of our resources, is no longer a positive presence in our lives? Maybe it’s not a matter of quitting forever, but it’s an issue of taking a break, taking time to reflect, and having enough information to make an informed decision. Training and sport are easy examples of such a struggle. Just today a new acquaintance told me that he had stopped running ultra-marathons when his kids were born. As I wrote in the Acknowledgements section of my book, “Kids are a great barometer of what is worthwhile in life.” When you are given precious little time to expand your life outside of raising human beings, you choose wisely–very wisely. And what you do with that time darn well better not detract from your ability to parent well. Mostly, at least for some time, the choices aren’t yours to make. There is the reality that the sleep-deprivation and other lifestyle issues that come with newborns is far from conducive to efficient and injury-free training. The decisions become pretty obvious pretty quickly. Serious injuries, much like having babies, also tend to cut short our training goals and athletic endeavors. When a physical injury prevents participation at a sustainable level, the question about whether or not it’s time to quit becomes easily answered. But what about scenarios that are not so clear cut? What about the grey areas when sport and training have become such a part of one’s life that it’s hard to imagine going forward without it, but at the same time participation has more and more downsides? How does one decide when it’s time for a break or time to call it quits for good? The implications for life outside of sport are easily conjured. How do we assess when it might be time to step away from the job we’ve had for years? How do imagine the possibility that a long-term romantic relationship might have run its course? Having the capacity to make changes in our lives is critical. Having the courage to shake up our own status quo is hard. Familiarity is comforting, even when imperfect. The idea of stepping away from something to which we’ve given a solid chunk of ourselves is frightening. Maybe it’s the feeling that all of the time, energy, planning, we have put into the endeavor will seem like a big waste if we leave it behind. Perhaps we are afraid that we won’t find anything else to fill the void. Maybe we stay in a relationship for fear of being alone. The same can be true of training for triathlons: are we afraid that we will feel aimless and have no structure if we were to stop? Then there’s the addiction element: perhaps something about our training and physical pursuits serves a function far greater than fulfilling our competitive drive or helping to keep us in shape. Maybe, like any addiction, it has become a way to prevent ourselves from feeling something we are afraid to feel or from knowing something about ourselves that we are afraid to face. By no means am I suggesting that there always comes a time when it’s time to quit a sport or a training pursuit. I am simply suggesting that you take time to reflect with honesty and courage on how this pursuit is working out for you. Are you generally inspired and jazzed by your training, or are there more days than not when you feel drained, tired, defeated? Motivation level is a critical indicator, not only of how well you are likely to do at a sport, but also of how positive the effects of your involvement are. If you are feeling unmotivated, it can be a sign that your emotional, psychological, and physical needs are not being met by participation in your sport, and it can also be a result of excessive stress and not enough success to feed your system. (see reference below: James Loehr’s book on Toughness Training has a nice section on low motivation). How about social indicators? Are your social connections being maintained in healthy ways, or are you finding that you are throwing yourself so heavily into your training that relationships outside of it have dwindled? Physical signs are equally important. Is your body responding in ways that show improvement, or are you constantly fighting injuries or pretending you don’t have pain when you walk? This kind of self-reflection is critical for ongoing happiness, development, and health. Of course there are some commitments that are non-negotiable. Parenting is one of them. You can’t decide a few years in that it’s just not working out for you because the effort outweighs the upsides. But most of us give a lot of ourselves to some other endeavor, and I’m arguing that it’s worth assessing the results of this at any given time. Given that we only go around once, figuring out when it might be time to step away from something—maybe forever and maybe just for a while—is probably a really smart thing to do. Leaving something behind makes room for something new, which is awesome. But let’s not jump right into that. There is much to be learned from allowing ourselves the gift of time, space, and the capacity for more. The next great thing will find its way in, and it just might be the very thing you had to leave behind in order to figure that out. Loehr, James E. (1994). The New Toughness Training for Sports. Plume: New York, NY. « Have an Audience? How Do You Handle the Pressure?